The Climate-KIC Green Garage opens its doors today (24 April) in Berlin-Schöneberg as the first start-up incubator in Germany that exclusively targets climate innovations. The new incubator will help Climate-KIC’s operations in Germany significantly accelerate the development of innovative products and services in the area of climate change. “Young founders and future climate entrepreneurs are our best investment in the future,” said Hans-Jürgen Cramer, director of Climate-KIC’s national centre in Germany. “With their innovative ideas they create the conditions for a sustainable and carbon-neutral economy,” he said. 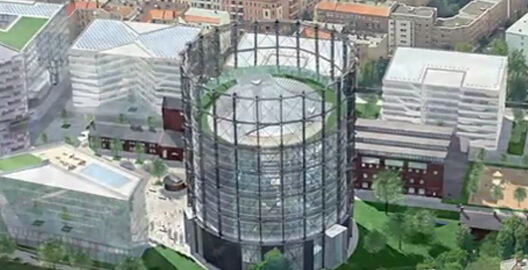 The new incubator is located on the EUREF (EURopean Energy Forum) Campus, a former industrial site now reconstructed and remodeled for business, research and education purposes. EUREF Campus hosts a variety of clean-energy related companies and organisations, and forms the largest climate-innovation campus in Berlin. Climate-KIC’s national centre and the Green Garage are based at the EUREF campus in Berlin-Schöneberg. The Climate-KIC Green Garage offers 280 square metres of modern working space for six start-ups, as well as space for workshops and seminars for up to 60 people. The first start-up teams – Efficient Farming City, Econitor, Puzzle Power, and Sustachem – have already moved in. Since 2010, Climate-KIC has promoted 80 business ideas in the early phase, from which already 23 new companies have emerged. This year alone, some 100 other founding teams will be funded. Climate-KIC Germany supports young climate entrepreneurs with up to €95,000, free work spaces in the Climate-KIC Green Garage, business coaching and access to the European partner network. 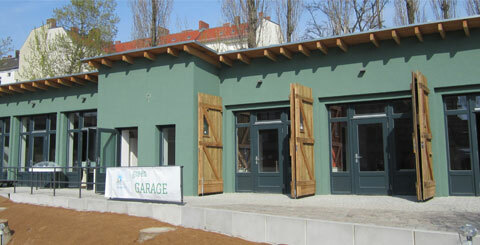 Exterior view of the new Green Garage premises. The Climate-KIC Green Garage has arisen from a historic garage built in 1927 on the site of the EUREF campus in Berlin-Schöneberg. The character of the building was preserved during the conversion and is an example of climate-friendly conversion of existing buildings. The building is heated with biogas, and the electrical systems have been connected to the EUREF campus smart grid. Historic wooden garage doors have been retained, and modern facade insulation and a solar roof have been installed.